Bond Economics: For The Japanese MoF, "Debt Service" Does Not Mean "Interest Costs"
For The Japanese MoF, "Debt Service" Does Not Mean "Interest Costs"
The chart shows the expected breakdown of expenditures in Fiscal Year 2014. As can be seen, "Debt Service" is about 23.7 trillion yen, or 24.3% of the expenditures, while gross interest expense is about 10.1 trillion yen, or 10.6% of the expenditures. And it should be noted that Japan's gross debt-to-GDP ratio is much higher than its net. 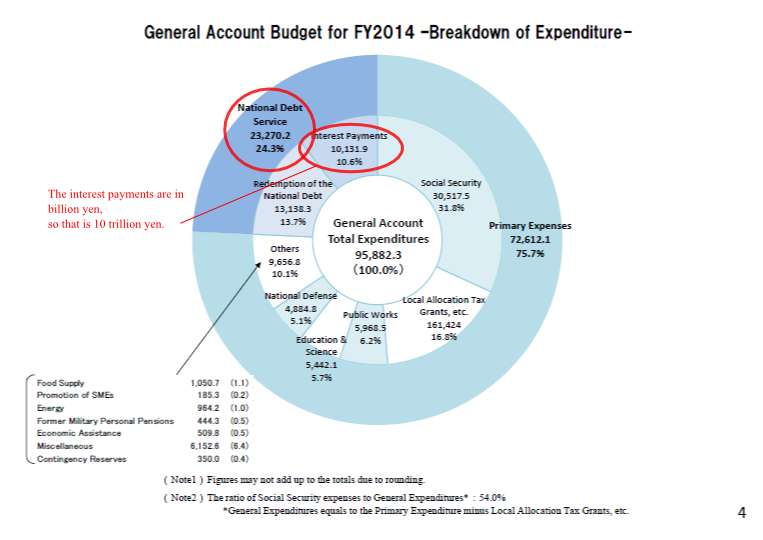 So the true net expenditure on interest is even smaller than that. Of course, Japan is running a massive carry trade, and some of the interest it is receiving is coming from its foreign reserves. As an addition note, that interest expense is an estimate - the MoF does not know what rates JGBs will be auctioned at. I believe that the estimate used is well above where market rates are likely to be. (7) Debt service already consumes 43 percent of the Japanese government’s revenues, just to cover interest on the outstanding government debt [emphasis mine, BR] — and in spite of interest rates being close to zero. Simply put, such a country is bankrupt. No economy can sustain a total debt level (for the government, households and nonfinancial corporations) of more than 400 percent percent of GDP without having a nominal growth rate that is significantly higher than the level of interest rates. Since gross interest costs are only about 19% of revenue, his statement is incorrect. I am not particularly interested in discussing the rest of his article here. My article on why the JGB market ignored the Moody's downgrade covered many of the structural issues he raises. The debt service ratio is the ratio of debt service payments made by or due from a country to that country’s export earnings. Export earnings? That is because this definition refers to external debt: debt issued in a foreign currency. The glossary is for external debt statistics. Since Japan has no foreign currency debt. its debt service ratio is zero. The "(external) debt service ratio" makes sense in the context of external debt. The government no longer has a central bank to ensure the orderly roll over of paper, and so principal repayments matter. You could possibly extend the concept to sub-sovereigns who are borrowing in the local currency. But it is meaningless for a currency sovereign, like Japan. The amount of principal due in a given year is entirely determined by debt management decisions. For example, my reading of the Japanese "debt service" figure is that it does not include Treasury Bills, which are rolled over multiple times within a year. If they were included (which they should be), the "debt service" to government revenue ratio would be even higher. I still have no idea why the MoF highlights a concept that only makes sense in the context of external debt, and which no other sovereign bothers publishing. Almost immediately after this article was published, I saw the same error committed. I might as well keep track of these, since this is kind of funny. Needless to say, this radical monetization of the entire government bond market is an act of financial suicide. The BOJ now dares not stop the printing presses because absent the central bank’s big fat bid, the market would gap up violently. Yet 40% of Japan’s government revenue is already absorbed by servicing its gargantuan public debt. Even a 180 basis point increase in average yields (meaning that the 10-year JGB would still be under 2% [? It would be at 2.1%. BR]) would absorb the remainder. That’s right, 100% of government revenue would be pre-empted by debt service. That's wrong, of course. Initially he does say "servicing" and not interest costs, and so he is technically correct (but misleading) about the 40% debt service statement. But his calculation is wrong: the average gross interest rate for Japan is about 1% (10 trillion yen interest on about 1 quadrillion gross debt), and that is less than 20% of revenue. The average interest rate would have to somehow rise to around 5% in order for interest costs to match total revenue. (One difficulty is that this would take years to occur, given that the average maturity of Japanese debt outstanding is about seven and a half years. Additionally, this assumes that revenue would not rise in response to increased nominal income, which seems unlikely.) His answer (only needing to double the average interest rate) implies that he believes the 40% "debt service" really is the interest cost. Let's face it, nobody expects David Stockman to be able to understand budget documents that are written in English. But the Economist? In terms of the government’s finances, perhaps it does not matter right now which scenario proves to be the more accurate. After all, the national debt, despite its gargantuan size, is not an immediate risk to financial stability. Nine-tenths of the debt is held domestically, so the government-bond market is not at the mercy of jittery foreigners. What is more, the Bank of Japan’s huge programme of quantitative easing has brought bond yields down to record lows. However, the government cannot keep those yields at rock bottom unless it remains credible, and the central bank will at some point want to end quantitative easing. As it is, the cost of servicing the national debt consumes nearly a quarter of the budget [emphasis added - BR]—more than pensions or health care. The cost would shoot up were bond yields to climb. The rest of the article is at a similarly low level of analysis as this excerpt. If you want Japan to reduce its debt, just figure out whose stock of financial assets you can reduce, and how you are going to do it. Have fun trying to enact that programme!